Heaven Sent Desserts is offering our fabulous Valentine's Day dessert for 30th on 28th! 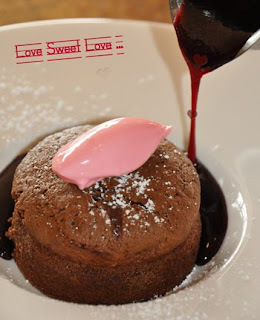 The incredible Chocolate Lava Lust is no ordinary chocolate dessert - the light, fresh and heavenly individual chocolate cake is filled with liquid cacao chocolate, served with a raspberry coulis sauce that "bites" the chocolate and make the tastebuds work overtime - it is truly to die for. Make sure to stop by and make your day a celebration on the 28th! Don't foget that we offer "Afternoon Delight" every day between 3pm and 6pm: Choose one of 3 desserts and a housedrink for $6 or bring a friend and have 2 desserts and 2 housedrinks for $10!